Champagne and stout seem like unlikely bedfellows. The first is usually expensive and sipped in celebration, while and the latter was long been the preferred everyday drink of the working-classes. Yet when they first met behind a London bar in 1861 — created to mark the death of Queen Victoria's hubby, Prince Albert — sparks must have flown, because bartenders still sling this drink today. 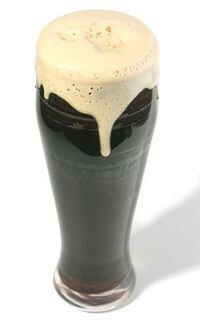 To make one, they'll fill a glass halfway with stout, then slowly top off with sparkling wine so that it appears to float above the beer. Each sip combines the lusciousness of stout with zippiness of sparkling wine, an unexpected but alluring mashup of flavors. (Pictured is stout alone, sans its champagne counterpart). If you've never sampled one, join us this Friday at 6 p.m. for Booze & Brews: Meet the Beer Cocktail. We'll have half-glasses on hand of each of the cocktails so you can try a few. Tomorrow, we'll take look at both the Beer-Ini and our own creation, On the Seventh Day.